I didn't do an empties post last month because I didn't have very many products, but between then and now I finished up/decluttered a ton of things that I can't wait to share! I'm reaching a point in my makeup collection where I'm trying not to buy as much simply because I'm running out of room to store it all! Lipsticks especially are getting overwhelming, which is why I'm decluttering so many in this post. Also I mentioned in my Going Cruelty Free post, I am making the transition to no longer buying makeup that is sold in mainland China (and is subjected to animal testing there) so a lot of things that I would have repurchased are no longer options for me. I will be honest about whether or not I liked a product, but I put a Not CF label next to non-cruelty free items as an explanation as to why I won't repurchase it. And with that, let's get on with the empties! A boring, standard empty--I'm pretty sure I've included a tube of this in every empties post I've done--I wear this every night before going to bed so that I don't wake up with dry lips. Already repurchased! I bought this on a whim from TJ Maxx, mostly because of the packaging. It is shaped like an old-fashioned milk bottle. It doesn't smell amazing, unfortunately, but it produces some major bubbles. I might consider repurchasing and mixing in with a bath product that has a nicer scent. I bought this to use as an alternative to Batiste dry shampoo, which leaves a white cast, while this one doesn't. However, I don't think that it absorbs oil quite as well as the Batiste ones and I will not be repurchasing. I loved this concealer and it lasted me a very long time! This was in my Project Pan for 2017 so I'm happy to be done with it. It blended nicely, had a good medium coverage, and felt hydrating and brightening under the eye. I haven't actually seen this in the drugstore in a long time so it may have been discontinued, either way I will not be repurchasing. This was one of my favorite mascaras back in the day so I decided to repurchase it and see if I still liked it. It's good for lengthening, but overall it's no longer one of my favorites. Another Project Pan product, I'm glad to finally be done with this one. By the end I was just using it to finish it if that makes sense! This Chubby Stick leaves a subtle pink tint that you could get with any tinted lip balm, therefore I don't recommend it and I won't repurchase it. However, the Chubby Stick Intenses are much more pigmented and still hydrating, so if you're curious about these I would recommend the Intenses instead! This is one of my favorite foundations from the drugstore. It has high coverage, doesn't emphasize texture, and there is a shade that matches me perfectly in the winter. It's very affordable though I would have been willing to pay an extra dollar or two for a pump! It has a subtle luminous finish, somewhere between satin and glowy for my skin. Most of the things I've decided to declutter from my collection are either very old, things that I never use, or both! I've had this bright Barbie pink tinted lip balm for years and though I like the formula, the shade isn't very flattering on me. This is the first liquid lipstick that I ever bought based on a pretty Instagram post from several years ago. I wore it a lot at first so that I could do a review of it, but since then I haven't worn it once. The formula is amazing but this color makes my teeth look so yellow! I think if you have a deeper skin tone and/or really white teeth you may love this for summer, but I just don't want it anymore. I truly don't know why I bought this? A few years ago I had decided to get really tan one summer, so I over-estimated how dark I would get and bought this tinted moisturizer. I used to mix this with foundations in the summer, but it is just too dark for me and it's definitely getting old. I can't even tell you how it performs because I never wore it on it's own! This looks amazingly metallic in the pan, but the moment I brought it home and swatched it....no. It's just glitter. Even with a wet brush I can't get it to look nice on the eyes. I'm sure my sister will like it, so I'll pass it on now rather than let it take up space in my drawers. I've had these for so long, they are definitely expired by now. Raspberry used to be one of my favorites. All of the shades are quite pretty, but they are getting lost in my collection. They are pretty standard lipsticks in my opinion. Raspberry and Rose Taffy both have some shimmer/glitter to them, while Plum Brandy is a typical creme finish. Same as the Clinique ones, I've had these for many years and it's time to get rid of them. Both of these are gorgeous colors. I would consider them both satin finishes. 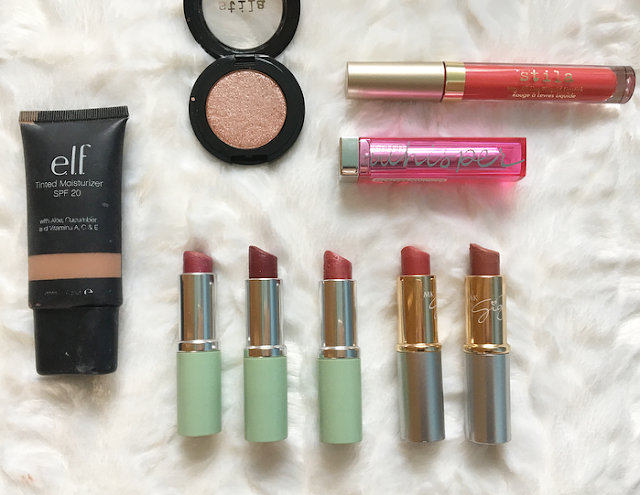 9 comments on "June Empties and Declutter"
It's unbelievable how many brands are not cruelty free, isn't it? And with the recent news that Nars are launching in China and will be testing their products on animals, what can I say?? It's a shame! such a shame about that stila eyeshadow. It looks so beautiful in the pan! I need to try more from Stila I've only ever used their lip gloss, but I've heard so many good things about them. 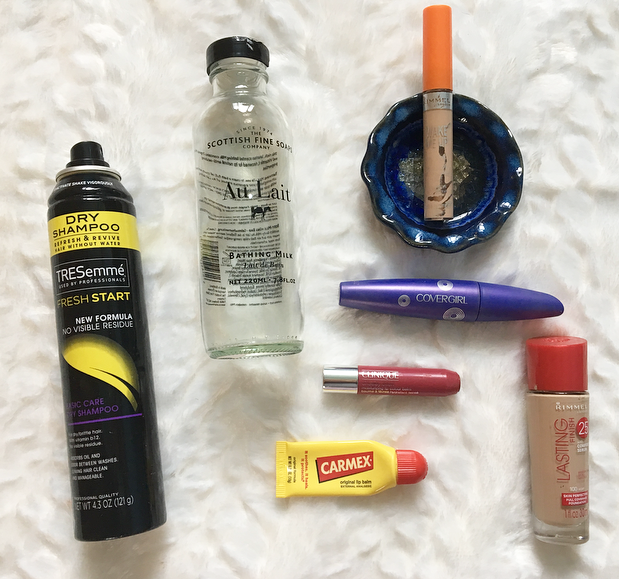 I feel the same way about the Carmex lip balm, it's in every empties post I've done. Is it hard when you know some of your favorite products (like this Rimmel foundation) is not CF and you just decided to go CF?